Saving bank account is most preferred method to keep extra money but saving bank accounts only gives interest in range of 4-6%. What to do to earn maximum interest. 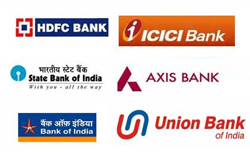 Well today we will discuss 10 best Saving Bank accounts with auto sweep facility which can earn more interest. If you have lot of cash lying idle in your bank account and you don’t want to invest this money for long term.What you should do? Well one way is to make Fixed Deposit of this money. But if you are too busy and forgot to make FD you may lose interest earning, another option is to enable Auto Sweep facility in saving bank account. What is Auto Sweep Facility? 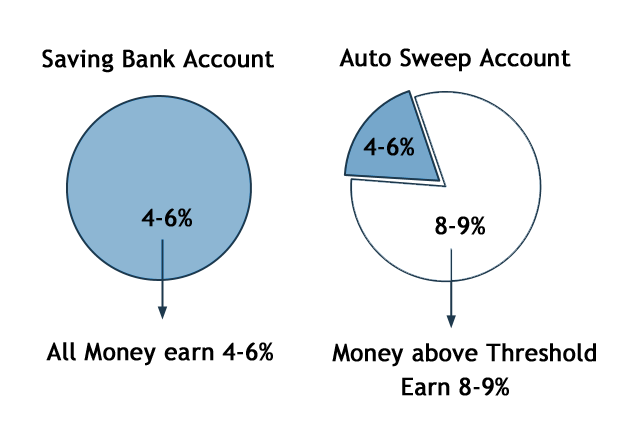 Auto sweep facility provides combine benefit of saving bank account and fixed deposit. This facility interlinks your saving bank account with fixed deposit account. This facility makes sure that extra money crossing threshold limit defined by you will automatically get transferred to fixed deposit account and you will earn better return. Example How Auto sweep facility can earn you more return? Suppose your saving bank account has Rs. 1 lac for 1 year. In normal saving bank account it will earn interest 4% which is Rs.4000 for year. If you have auto sweep facility with threshold limit of Rs. 10,000 than additional Rs.90000 will form fixed deposit and earn 8% interest. At year end you will earn Rs. 400 interest earn from Rs. 10,000 plus Rs.7200 interest earn from Rs.90000. So Total interest will be Rs.7600 which is far greater than interest earn in first case. Today multiple banks provide auto sweep facility but they name it differently. HDFC bank calls it Sweep-in. ICICI bank calls it money multiplier and SBI calls it saving plus. Below is list of 10 Best Saving account which can earn maximum interest. According to me this account is idle place to keep emergency fund. So if you are keeping your fund in saving bank account make sure you take auto sweep facility to earn better returns. You were aware about auto sweep account earlier? Do you think this information will be helpful to you? Do share your comment in section given below. Kindly tell that which bank offers the lowest threshold limit with an okay kind of interest rate? or rather, can you please mention which bank offers how much threshold limits? If you can go for SBI it is offering threshold limit of Rs.10,000.You are likely to earn around 8% interest rate from SBI autosweep. Sir,me cisf(peramilitary force) me job karta hu. Sir hmara sbi me salary account hai..sbi me MOD balance k liey minimum threshold bal 25000 hai..aur interest/year 7.75 hai.. Plz sir,guide me k kis bank me MOD K LIEY minimum threshold bal limit kam hai and interest rate zyada..hamara paramilitary account hai..hmare se related koi aur plan hai to plz btaein ,sir…thanking you.. Right now no such account is available, however i will try to find and share information. Normal FD rates are applicable in these cases. You can refer to https://moneyexcel.com/11253/latest-fixed-deposit-rates-july-2015 for latest interest rates. What is the criterion for using this top 10 list. Even PNB offers auto sweep with good interest rates. I think SBI offers the lowest one. This list is created to provide information to reader about this facility. It is not in any particular order.